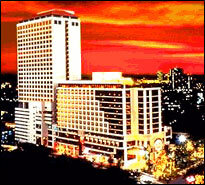 The "Emerald Hotel" is located in the heart of Bangkok's most exciting business, entertainment and shopping area. Only 20 minutes away from the central business district and easy access to other tourist and local attractions. Our 625 guest rooms are furnished with color TV with satellite and cable, In room safety box, 24 hours room service. IDD telephone and a mini-bar are available in all rooms. Coffee / Tea maker is provided in all our deluxe and suite rooms to complete all guest comfort. The Emerald's Executive Floors are located on 26th-28th Floors of the "EMERALD TOWER". 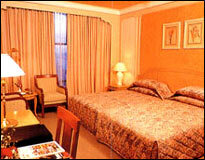 On the "Executive Floor"
there are 31 Deluxe rooms, Executive Suites and the Emerald Suite. As a guest on the Executive Floor we offer welcome drink complimentary breakfast, evening cocktails and private meeting rooms. Business travelers can enjoy full business service facilities including a private meeting room. Open 24 Hours a day it offering international buffet breakfast, lunch and a Thai Buffet in the evening. An International A-la-carte menu is available all day. A Cozy, friendly meeting place with a cheerful pub atmosphere where you can enjoy your favorite cocktail and relax to the sound of live entertainment nightly. If you love to eat, then Daiichi Buffet Restaurant is the place to be. Each day you will find an endless selection of fresh seafood and cooked dishes. Daiichi also features two teppanyaki bars and six private tatami rooms with karaoke. of Yin and Yang energies that are vital to good health in the body, mind and spirit. Featuring a snooker room, the Canary Karaoke with more than 500 laser discs. The Carnival Pub with its exciting live-band entertainment and the Sparks Discotheque - all conveniently located under one roof! The Emerald Health Club is located on the 11th floor, and as our guest you can enjoy all the state-of-the-art equipment. A separate sauna, steam room, massage and Jacuzzi for men and women. 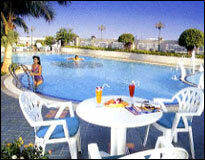 Enjoy a vigorous workout at the squash court or soak up the sun at the outdoor swimming pool. - Sauna Luxurious men's and women's sauna and steam room. - Massage : Professional masseuses are available to release muscle tension and stress for both men and women.